I saw my surgeon for what was probably the last time yesterday. While I was there I snapped a picture of the X-rays that were taken a couple of months ago, about a week and a half after the surgery. 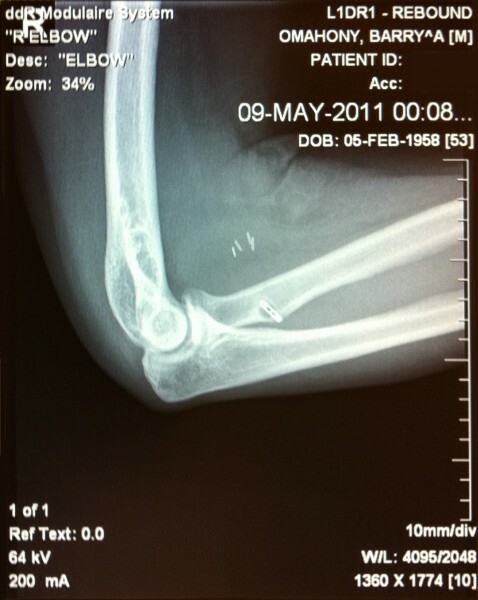 Even the doc said this was “a pretty cool picture”. You can clearly see the hole that was drilled in the radial tuberosity on the radius bone, into which the end of the tendon was attached. At the same spot you can see the “endobutton”, a small piece of titanium that the tendon was sutured to. The endobutton was then passed through the hole in the bone and rotated, fastening the tendon in place. The four small other pieces of metal are clips placed on small veins to control bleeding during surgery. The veins eventually regnerate around them. You are currently browsing the coyotecreekranch.com Family Blog blog archives for July, 2011.